Good morning! I guess, pancakes is the most wanted breakfast on Earth. 😀 No matter how you call them in your country, whether you like thick or thin pancakes, sweet or savory – they are all delicious! 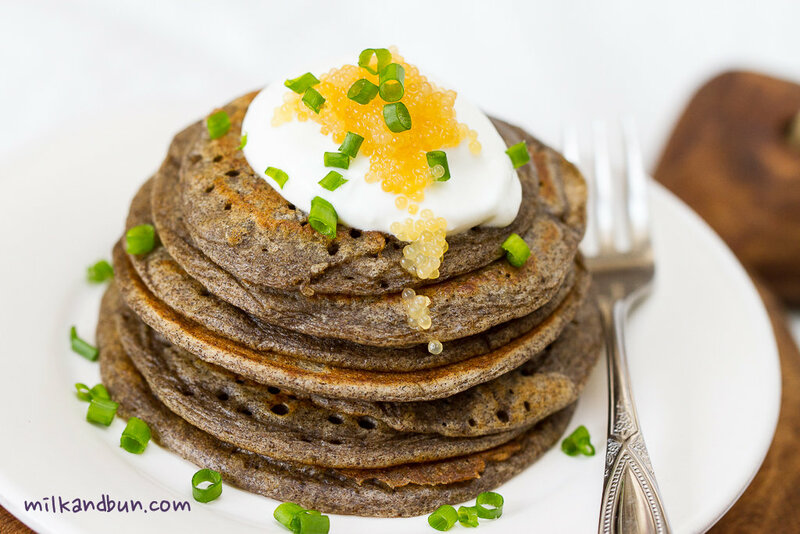 Today, I’d like to share the recipe of Russian buckwheat oladushki (small pancakes). In Russia we like buckwheat grain and consume it in enormous amounts; it is not only the tasty grain but also very healthy (it contains no gluten, and a good source of protein). 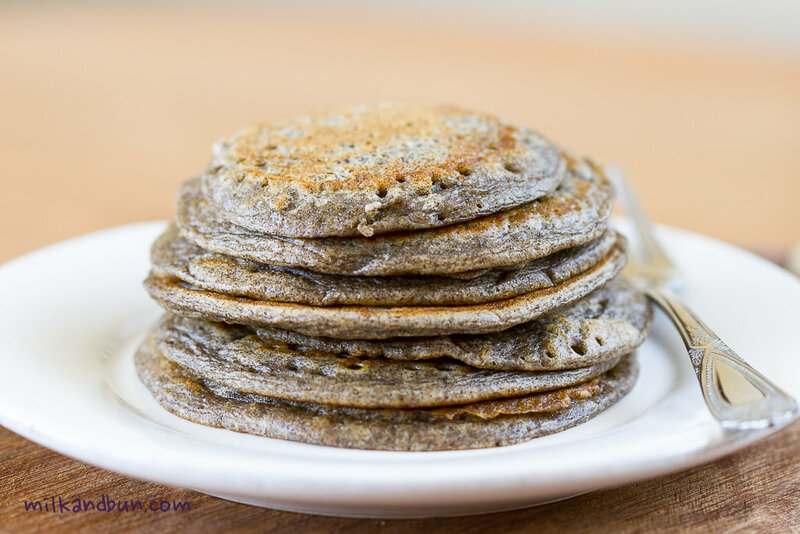 So buckwheat flour is also popular and widely-used in preparation of various pancakes, vareniki or cakes. The flour is a bit heavy itself, plus I used wholegrain one, and as you can see from the photos: my pancakes turned out not very thick. But if you like them thicker and fluffier, add less buckwheat and more plain flour. These pretty dark and so-healthy pancakes go great with a dollop of fresh sour cream and slice of homemade cured salmon! I brought a can of pike caviar from Russia, and garnished pancaked with it. It’s not very salty and suits perfectly here. Of course I understand that it’s not easy to get pike caviar (at least find it Russian store), but you can substitute it with salmon or any other fish caviar you like, or a thin slice of smoked salmon is another awesome option. In a large bowl, whisk egg with salt, milk, sour cream and oil. Sift plain flour, add buckwheat flour and soda. Mix all ingredients to combine. Heat a frying pan or skillet of a high heat. Add 1-2 tablespoons of oil, if needed. Using a ladle or cup, drop some batter on a pan until desires size of pancake is reached (I made 7-8cm). Cook until edges begin to look dry and bubbles start to form, about 1 minute. Then flip the pancakes and cook 1-2 minutes more on the other side. Repeat with remaining batter. Serve with a dollop of sour cream, top with a few teaspoons of caviar and sprinkle with chive if desired. Sep13September 13, 2015 • By milkandbun • This entry was posted in Breakfast, Russian cuisine and tagged blini, blini with caviar, breakfast, buckwheat flour, Buckwheat pancakes, caviar, cooking, easy recipe, food, food and recipe, food photo, food photography, food styling, healthy, healthy recipe, pancakes, pancakes with caviar, photo, photography, pike caviar, recipe, Russian, Russian caviar, Russian food, Russian recipe, sour cream, Sunday breakfast, weekend. Bookmark the permalink. Those look beautiful! I love how dark they look, with the sunny heads of caviar. Time for breakfast! Thanks a lot for the lovely comment!😊Have a great weekend! This is like a Blini, love it!! Just in time for the Sunday breakfast! The scallion finish touch looks great! good to know about the blini!! it’s funny, I just commented on someone’s post that I have to use 1/2 buckwheat and 1/2 wheat flour when i make pancakes. 100% buckwheat is too strong for me. Lovely pancakes!! !